Innovation Unlimited Inc. launches GOLFSTR ads on the Golf Channel to help 50% of golfers who swing a golf club like a baseball bat. Golf is not baseball so golfers need a golf training aid that can be worn for 18 holes to help rewire their brains. Golfers who have swung a club incorrectly for 5 to 50 years need a brain trainer. Seeing and knowing the correct swing is not enough to reprogram the brain. Sure, the brain can control the swing when it is done in slow motion. But when golfers are ready to hit that little white ball, the grey matter between their ears takes over. The bigger the windup, the faster the swing and the further the hit. It just does not work this way. Unfortunately the golfer’s brain is programmed this way. 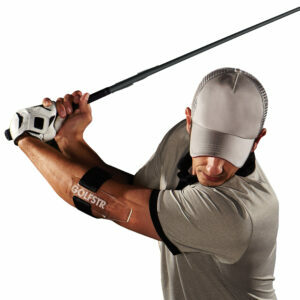 GOLFSTR is a brain trainer that reminds golfers to keep their leading arm straight in the back swing. It’s amazing how such a soft touch on the back of their leading upper arm can generate so much power in the golf swing. The key to success is not only using GOLFSTR to practice but also play 18 holes of golf with this reminder to keep their leading arm straight. The brain rewires and muscle memory takes over. It takes time and focus to learn a new swing but GOLFSTR is constantly there as a reminder during the tee-off, on the fairway and while chipping to the green. She is your best friend. William Curry the inventor, developer and manufacturer of GOLFSTR, launched this brain trainer to retailers of the world in the PGA Golf Merchandise Show in Orlando, FL in January. He calls it the portable pro as it is so convenient to use. Until recently GOLFSTR has only been available for purchase on https://www.golfstr.com. With impact from the Golf Channel ads it will soon be in all golf retailers. 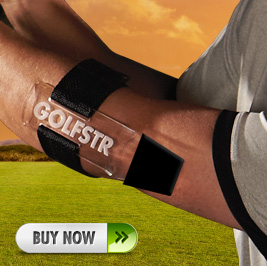 GOLFSTR’s an unfair advantage so it can’t be used when playing in competition. Imagine what it can do to lower scores. With practice it rewires the brain to improve muscle memory.